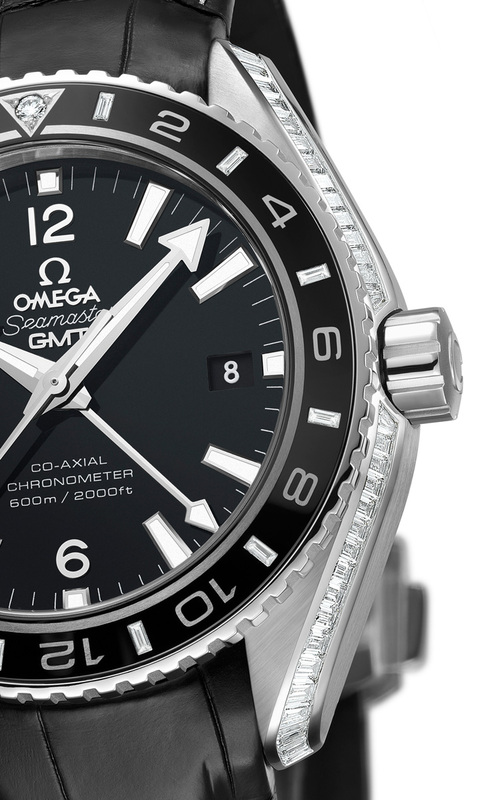 Omega has notched up a notable technical achievement with the Seamaster Planet Ocean Platinum with diamond-set ceramic and sapphire. It features diamonds set in the ceramic bezel and sapphire case back, the first time in watchmaking diamonds have been set in such hard materials. 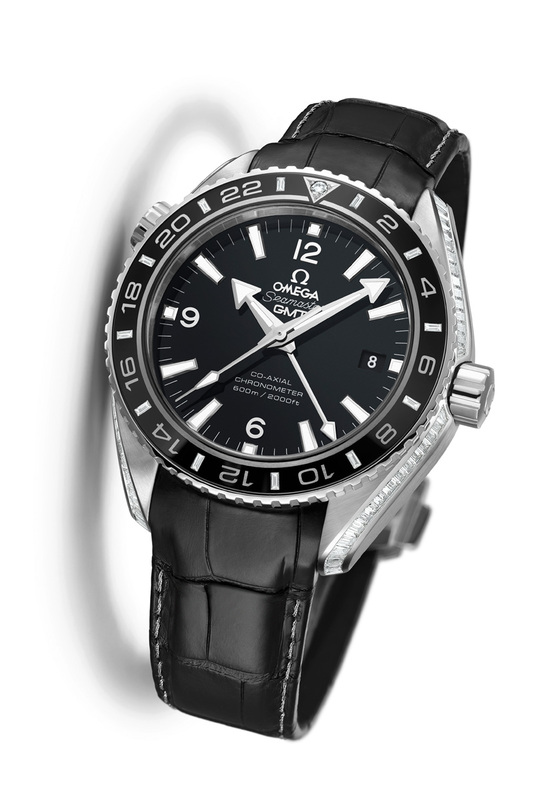 The Omega Seamaster Planet Ocean Platinum with diamond-set ceramic and sapphire is a platinum Planet Ocean GMT with some very unusual gem-setting. All around the black ceramic bezel insert are baguette diamonds markers for the odd numbers of the 24 hour scale. And at the top is a a round diamond set in the triangle marker at 12 o’clock. 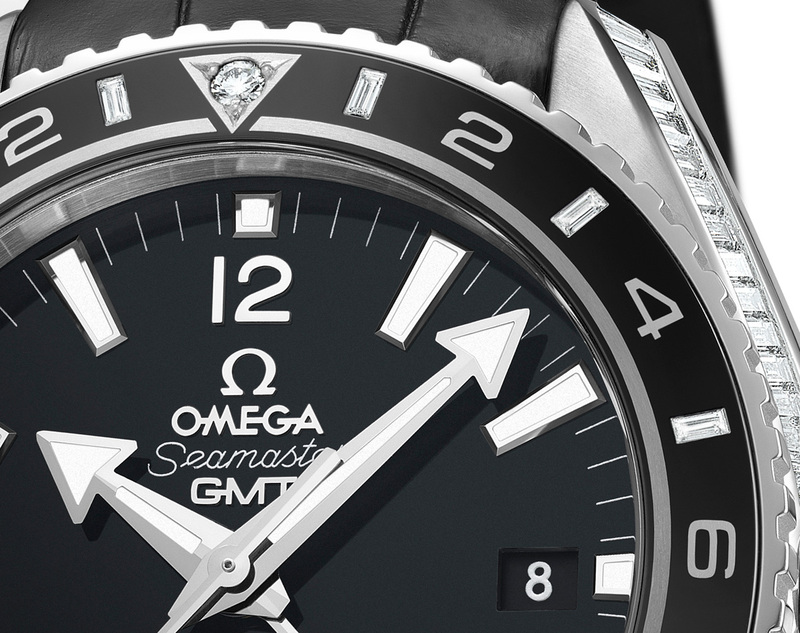 Never before in watchmaking have diamonds been set in ceramic. This is done by first laser-engraving the ceramic bezel and then depositing 850 platinum alloy into the engravings, bonding the alloy to the ceramic. Diamonds are then set into the platinum surfaces of the ceramic base using traditional setting techniques. Specifically, the accomplishment is not actually setting the diamonds on the ceramic surface, which is impossible due to its hardness, but in being able to precisely bond the platinum alloy with the ceramic in such a way that allows for gem-setting. Baguette diamonds are also set all along the bevels of the case, and also on the sapphire case back, using a process similar to that for the bezel. Limited to eight pieces, this Seamaster Planet Ocean Platinum is delivered with a platinum folding buckle, with a retail price of about €100,000, or about US$135,000. In time to come this gem-setting process will be used on lower priced timepieces.